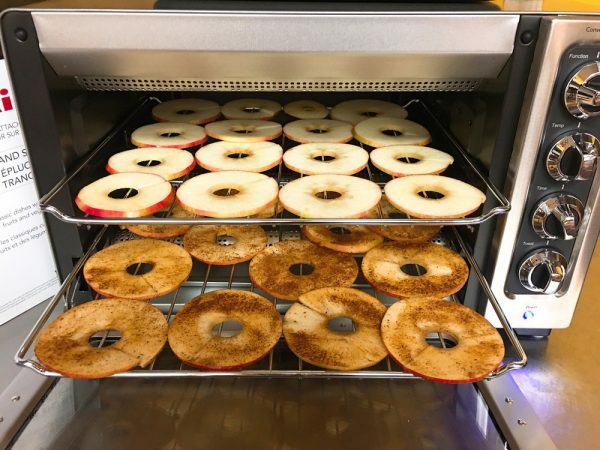 Place the slices directly on the oven racks. Set temperature to "Warm" - this will be about 150 degrees F.
Allow them to dry to desired chewiness. Mine took 2 hours. They shrunk quite a bit and felt leathery on the outside. The cinnamon ones tend to finish a little sooner, I think the cinnamon helps draw or absorb some of the moisture. Turn the oven off and allow them to cool in the oven. I store them in an airtight container for a few days or in the refrigerator for longer - but they probably won't last that long! My sister made them without a convection oven. It will just take a bit longer. Just dry/cook them to your desired level of chewy or crispness. You can open the oven door slightly periodically to allow the moisture out of the oven.